Russian lies part 133: “we do not use BUK missiles produced in 1986”. | What happened to flight MH17? The Joint Investigation Team at its press conference at May 24, 2018 show a part of a BUK missile which was found in Eastern Ukraine. The part, called a casing, showed on the outside a number. This number is a code showing the type of missile and when it was produced, which was 1986. However photos prove this is a lie. A lie in a long series of lies.I wrote various blogposts about the many lies told by Kremlin. For example here, here, here , here and here. Reuters published an interesting photo at August 16, 2014. The photo shows two interesting details. 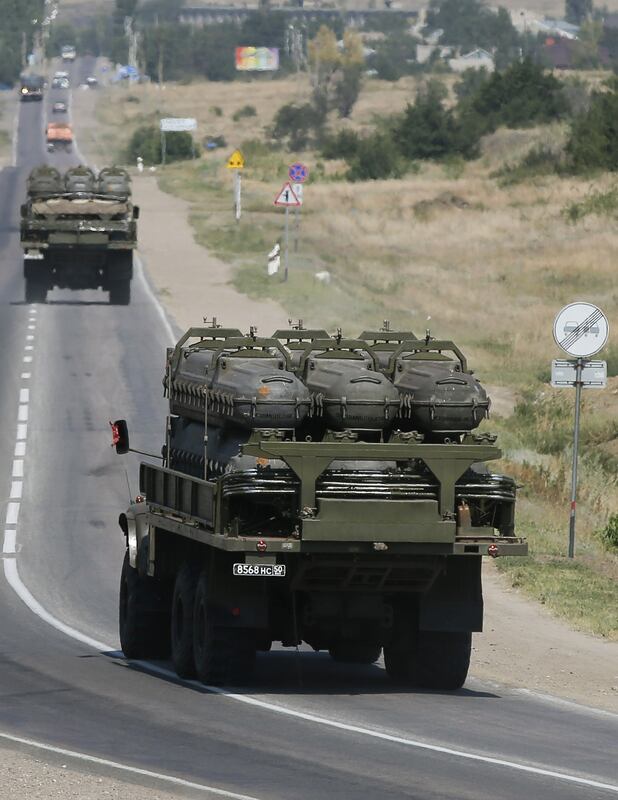 First, a truck carrying containers for BUK missiles. Each container has a number printed on it. The second interesting detail is the truck which has a crane on it. Mind the metal piece on the back which is slanted. When zoomed in towards the truck transporting the containers we see the one of the numbers. It is 9M38M188661436? XXXXXX = The 9M38M1 part shows the type of missile. A= On most of the missiles the next number seems always to be the digit 8. This is the code for the manufacturer of the missile. 8 = Dolgoprudny Research Production Enterprise located near Moscow. BB = the year of the missile was build. CCC= The next three digits show the batchnumber of the missile. What characteristics are shared by missiles sharing the same batch number is unknown. It could be used to identify the factory, the metal used, the month produced. DDD= The last three numbers is a code for the missile. Combined with the batchnumer this is a unique number. One of the containers carried by the truck clearly shows a production year of 86. Russia debunked: the photo proves Russia in August 2014 did use missiles produced in 1986. Reuters published two photos in the same article of a Russian army convoy travelling on a road near outside Kamensk-Shakhtinsky, Rostov Region. The photo here has some EXIF info. It shows the pic was made at August 16, 2014 at 10:53. Mind this is the time and date setting on the camera. The first truck has license plate 8564HC. The second truck has license plate 8568HC. Here the numbers on the containers are clearly visible. A closeup showing all three containers shows various years of production. 2 containers showing 86 and 1 container showing 92. 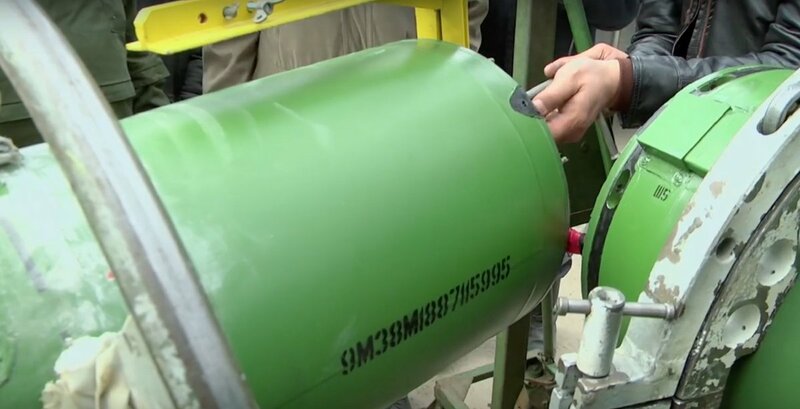 The production date is seen on the BUK engine casing as displayed by JIT. It shows 15 12 86. Likely December 15, 1986. The code on the left, is a different code. It has the type of engine, a batch code and a serialnumber. The same code is encraved in the engine nozzle. Another interesting detail of the Reuters photo is the truck with a crane installed on it. A video showing trucks of the 53rd brigade from Kursk, shows an identical looking truck. The license plate seems to match as well as the slanted piece of metal at the back. If the BUK missile casing shown by JIT was an Ukrainian used missile , Russia would have pulled out the sales slip and proven that BUK with this number was sold/transferred to Ukraine. Instead, Russia told nonsense on the year of production. It is another indication Russia shot down MH17. 26 Comments on Russian lies part 133: “we do not use BUK missiles produced in 1986”. Uitleg van het nummer vind ik zeer zwak. dan weet je ook niet wat bb, ccc en ddd is. Gokken wat iets betekent heeft er voor gezorgd dat Lucia de Berk zeven jaar onschuldig in de gevangenis heeft gezeten. In de Schiedammer parkmoord is door een verkeerde uitleg van bewijs zelfs onder druk een bekentenis uitgeperst en heeft opnieuw een onschuldig persoon een gevangenis straf ondergaan. Onlangs heeft het OM in de zaak tegen de doders van Mitz Henriquez gemanipuleerd videomateriaal als bewijs ingediend. Trackrecord van OM is dus niet best. Nederland zegt een rechtsstaat te zijn en dan hoor je niet met vaag bewijs een schuldige aan te wijzen. Als je niet weet wat de codering op een raket betekent dan vraag je het na bij de fabrikant of een andere betrouwbare bron. Ukraine gebruikt dezelfde raket en is volgens het OM nauw verbonden met jit (https://www.om.nl/onderwerpen/mh17-crash/). Als niet de moeite wordt genomen om aan zo’n partner uitleg te vragen over de codering dan geeft dat te denken over de nauwkeurigheid en oprechtheid van jit. Het blijft blijkbaar lastig om te lezen. Het staat vast dat de casing die JIT toonde in 1986 is gemaakt. Dezelfde nummering voor de raket wordt ook gebruik t voor de containers waar de raket in wordt opgeslagen. Als die raketten bevat met bouwjaar 1986, dan is toch logisch dat Rusland liegt. De rest van de reactie is net zo’n onzin. Ik werk niet voor het JIT. JIT weet echt wel wat die codes inhouden. Maar als de rechter vraagt hoe ze dat weten, en Oekraïne heeft het verteld, komt de advocaat met het verhaal dat Oekraine niet te vertrouwen is. Dit is een dubbelcheck. Het toont ook nog eens aan dat Rusland niet meewerkt aan het onderzoek. Het nummer is op veel meer manieren uit te leggen, bouwjaar kan ook 1988 maand 6 oid zijn. Je ziet dus zelf ook al in dat Ukraine niet een betrouwbare partner is voor bewijs materiaal. NATO partner Finland heeft BUK raketten in gebruik gehad die zou misschien meer kunnen vertellen over de codering. Nederland verwijt Russia dat het niet meewerkt maar fabrikant Almaz-Antey heeft wel meegewerkt aan ovv rapport. Op dit moment is de situatie dat JIT alle bewijs zodanig uitlegt dat Russia schuldig is. Jit is voor Russia geen betrouwbare partner. Je onschuld aantonen is in zo’n situatie bijna onmogelijk, meewerken heeft dan ook geen zin. Logisch is om bewijs van je onschuld achter de hand te houden voor een eventuele rechtszaak of tribunaal. There’s something potentially decisively important — which I missed at first. If you look at the photo of the rocket part which shows the JIT then rectangular pieces are “ripped out”. But these are not damages as I first thought — but pieces removed afterwards with a saw or the like. Obviously the thing was almost intact when it got the JT. 1.) What was sawn out of the rocket part — and why? 2) and more importantly — why was the rocket part almost undamaged? That can’t be true at all. a.) The warhead weighs about 70kg of which 50kg is explosives only. The warhead is in flight direction slightly in front of the beginning of the wings, the part which shows the JIT. A test ignition of the warhead in the missile in the attempt of Almas Antey leaves no parts of the missile fuselage as intact as the part showing the JIT (at minute 59:00). c.) It is not plausible that about 1.5m from the center of the explosion of the 70kg warhead with 50kg explosive the fuselage of the rocket is not torn. The part the JIT shows raises more questions than it provides answers. The JIT should explain exactly how and from whom it got the part, where and how it was found. And the JIT should show exactly which part of the rocket it is, the wings are 2 meters long — the part not. a=8, bb = jaar, ccc = onbekend, mogelijk een batch, ddd = een volgnummer in de batch. Soms staat er een M in het nummer, dan zit er een 9M38M1 in de container. Als deze M er niet in staat, is het een 9M38. Als je goed op de Reuters foto kijkt zie je dat er zowel een 9M38M1 als een 9M38 uit 1986 in de containers zit. 1986 is het jaar waarin zowel 9M38′ s als 9M38M1’s werden geproduceerd. Ik denk dat daarom het JIT van een raket uit de 9M38-serie spreekt, omdat ze het onderscheid niet kunnen maken op basis van de gevonden onderdelen. How was it possible to produce the ‘zoomed in’ photo showing the Buk serial numbers from the Reuters photo? I’ve tried zooming in and there’s no way such a detailed closeup can be produced from that photo. Nothing is readable, it’s just pixels. What is the original source of the ‘zoomed in’ photo? Reuters published two photos showing different trucks transporting missile containers. The other one I just added to the blogpost. That’s great, thanks. Can you give a link to that second photo on Reuters site as Tin Eye reverse image search doesnt find a connection to Reuters? It is in the post and I just copied the URL so it is clear the second photo is in the same Reuters article. Philip it is not. Use Google image search and you find large photos. As Reuters blocks image search, take a snapshot of the photo, store it on your computer. Open the photo in Google Chrome, right click, image search. The conclusion that is presented here can be wrong. Question: How do soldiers practice the handling of anti-aircraft missiles and what is mounted on a TEL or TELAR in military exercises, parades and so on? No live ammunition, of course – this is too dangerous and too expensive, the real anti-aircraft missile costs a hell of a lot of money and contains well over 100kg of explosive solid rocket-fuel and a warhead. I did my military service with missile-based anti-aircraft defense – in all that time I have not even seen a single real rocket in the meaning of live ammunition! For NATO troops, live ammunition / real missiles are shot and handled in the EU only in Crete! And the Russian military it is more or less the same. The Russians have only one firing range for real anti-aircraft missiles in the meaning of live ammunition. All that is needed in daily training and air defense exercises as a substitute for a real rocket is training/dummy munition in the meaning of an “empty” missile container (NATO Patriot) or a rocket shell without solid fuel and warhead (NATO Hawk), and some but not all electronics. Some concrete weights and some minor electronics create the same handling and signal to the TEL or TELAR that a real rocket is mounted (which of course is not the case). And in the Russian military this is more or less the same. We see 3 missile containers with 9M39M1, one of 1989, two of 1986. All from the same perspective and the same excerpt. But only the rocket container from 1989 has warnings on flammable and explosive. 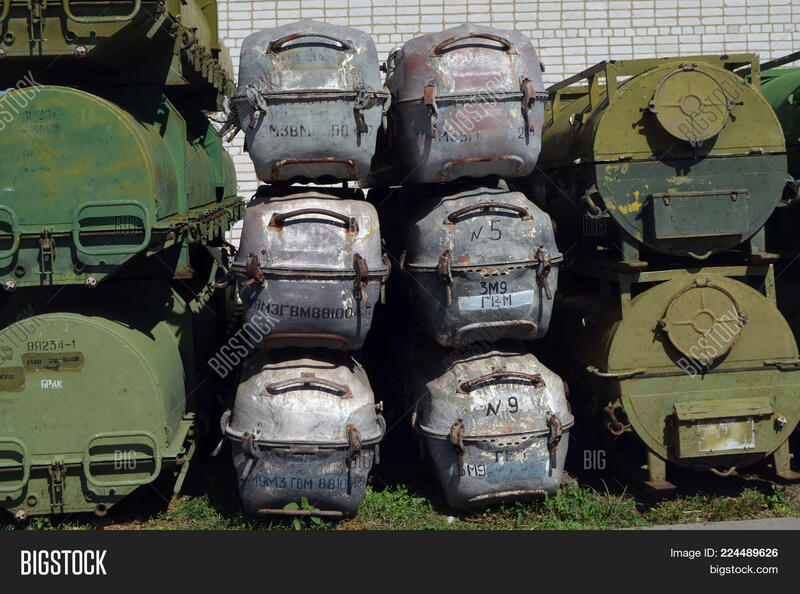 I expect simply because the other two rocket containers from 1986 certainly contain no “real” rocket in the meaning of live ammunition, these two containers contain only training/dummy ammunition without warhead and propellant/solid rocket-fuel. Missile ammunition is being decommissioned because it becomes unreliable (electronics) and dangerous (old propellant/solid rocket-fuel can explode by rocket-start). There is no reason to put training/dummy ammunition without warhead and propellant out of service, not even in Russia. The foto is no real proof that russia does not decommissioned “real” 9M38M1 missiles after 25 Jears of storage. Becorse we speak only about decommission “real” 9M38M1 in the meaning live ammunition with solid fuel, warhead and full electronics (Radar-Seeker etc.). It is unlikly that dummy ammunition without solid rocket-fuel, warhead and full electronics will ever be decommissioned (before the whole Weapon-System BUK will be decommissioned) becorce there is no need to. Perhaps “flammable and explosive” was added in production around 1990? To be honest — I don’t know. At NATO, the simply dummy ammunition has a blue marking or stripes, as in Russia’s current dummy ammunition is marked in air defense I do not know. 1.) Officially, the deployment of Russian air defence at the Ukrainian border was an exercise and lasted several months. Therefore, it is very certain that the Russian troops also carried dummy ammunition with them and also carried out maneuvers in the sense of military exercises. If we assume that dummy ammunition is not or hardly discarded — then a photo of a missile older than 25 years is no proof that Russia does not discard live ammunition after 25 years. 2.) A BUK 9m38M1 rocket can be stored in the storage container for 10 years. After 10 years, the missile must be returned to the manufacturer, inspected, repaired if necessary and newly sealed in the container. (The container is sealed, a missile that has been removed must also be returned to the manufacturer and will be checked, repaired if necessary and newly sealed in the container. If signs of explosives and hazards were not placed on the containers until after 1990, then it is very likely that an old rocket will also receive the “new” explosives/hazard notices on the container after the inspection. A missile from 1986 would have been inspected for the first time in 1996, then again in 2006. The argument that the safety instructions are new and therefore there are no safety instructions for old missiles is possible — but not very obvious. There’s no proof here that Russia is lying. This does not prove that the Russian statements about the lifetime of the 9M38M1 are correct. But it is dishonest to dismiss every Russian statement as a lie and to believe everything the Ukranian intelligence service says. They are proven liars on Mh17 matters. Therefore it is right way to assume they lie more and more, but at the same time one should anyway listen what they say/show. I hope I personally have never done that. No intelligence service exist to tell the truth to general public (IMO, they are paid to tell the government “truth”). Thanks for the source — it is always good to have a more primary source. a.) JSC “DNPP” confirms therefore that the normal service life of one 9M38M1 ist lower than 30 jears (25 maybe). b.) JSC “DNPP” directly says the studiy is done for 9M38M1(E) from a foreign country (word by word: “foreign customer”)– unsing “export-version” of BUK-M1, BUK-M1-2 or BUK-M2. c.) JSC “DNPP” mainly speaks about “E-versions” 9M38M1(E) and 9M317E. “E-versions” like 9M38M1(E) and 9M317E are the “export-only” versions of the missile. Export-versions are different in detail to do not give away to much miliary secrets — therefore Export-versions are export only. d.) JSC “DNPP” says “work is planned” in Sommer 2013 for a foreign customer, what makes it unlikly that it was finished in spring 2014.
e.) JSC “DNPP” does not say “work is planned” for any domestic (russian) missiles. The JSC “DNPP” confims the limited lifetime of 9M38M1 to be under 30 years in general. The JSC “DNPP” shows that it is technikly possible to extend this “save livetime” to 30 years. The JSC “DNPP” makes in  no statement about any plan to exten the “save livetime” of domestic (russian) 9M38M1. I personaly think we have to consider that 25 years “save livetime” for russian 9M38M1 is the truth. the report suggests all 9M38M1 manufactured after 1983+ (and for sure 1986) were stored awaiting for a decision on extending their shelf life, and not destroyed. A positive decision might well be taken yet before July 2014, while obviously a formal decision would not be essential for such a use, if the studies already confirmed it was safe. Here we can see what missile Almaz-Antey used in 2015 in their test vs IL86. That doesn’t prove anything either. For a blasting test like the one carried out by Almas Antey, neither an operational aircraft nor a operational missile is needed. It is quite possible that the same way as the discarded IL86 was used which waits for its scrapping an old discarded 9M38M1 was used. The blasting test requires neither the correct functioning of the propellant nor the electronics. Why would Almas Antey sacrifice a rocket with maybe 100,000 Euros residual value when there are worthless old 9M38M1 waiting to be scrapped? The JIT itselve did some blast-test with an 9M38M1 (1). And the JIT used an old missile from finland. And this means the JIT itselve used an missle that was decommissioned (2). So if it is “normal” that the JIT used an old decommissioned missile i thing it is likley that Almas Antey does the same. (1) JIT used not the complete missile — only the front-section. (2) finland decommissioned all BUK in 2015   . JIT used a missile which exact type cannot be determined by the public! Interesting points vs training missiles etc. Thank you. Indeed, photographed y1986…1987 Russian missiles might not have been in operational/useful live-fire condition. +we can not be sure about it. I beg your pardon, the supports do not unfold, but come out of the protective box.